An avid fan of Lewis Caroll's Alice in Wonderland and through the Looking Glass, Laduree's Holiday Collection has me besides myself with anticipation!! Now, I'm not sure if this Collection is inspired by the stories, but it's themes appear reminiscent (at least, in my opinion) of the fantasy world within the books. The Holiday Collection will be divided and launched on two separate dates, November 2nd and December 7th. Limited Edition Mini Face Color Rose Laduree in Holiday A 101, and Holiday B 102 ¥3,360($43.52). Limited Edition Cheek Color Mini Collection in 01, 02, 03 ¥5,775($74.79). Limited Edition Rouge Mini Collection in 01, 02, 03 ¥5,775($74.79). 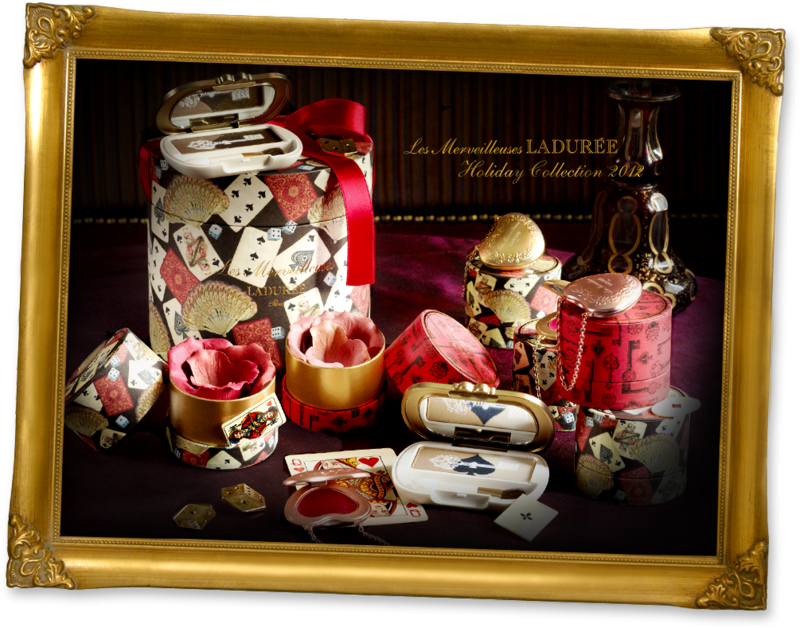 Limited Edition Holiday Laduree Box ¥2,940($38.08). Limited Edition Holiday Card ¥630($8.16). Limited Edition 2012 Eye color in 101 and 102 ¥4,200($54.40) Case sold separately ¥1,575($20.40). Limited Edition 2012 Rouge in 101 and 102 ¥4,410($57.12). To see the actually images, please click here. What holiday collections are you looking forward to? I need one of those Mini Face Colors or the Cheek Color Minis. It looks like a little purse! Btw do you own any cheek products from Laduree and what do you think about them? Hi Blair! I own several of their Cheek products, and I love the pressed powders, and the Cream Cheek base work beautifully during Fall and Winter, but they don't perform well in hot and humid weather. Wow, gorgeous collection! The limited edition eye colors are really creative. I know!!! I'm in love with this collections packaging! !